This tapestry, from a series of eight named. 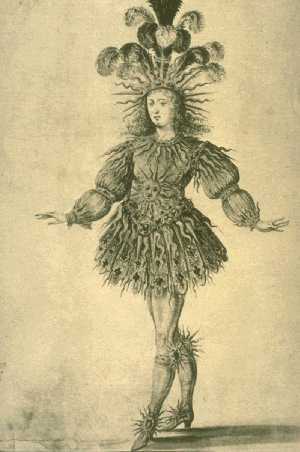 Les Anciennes tentures des Indes, became a gift from one sovereign to another. Tapestries were exceptionally expensive to produce on account of the materials, labour and time involved. So only the very richest classes could afford them. This series, showing a new paradise decorated the palaces of Louis XIV, the palace of the Knights of Saint John on Malta, the palace of Peter the Great 1672 –1725 at Peterhof near St.-Petersburg and many other royal residences. 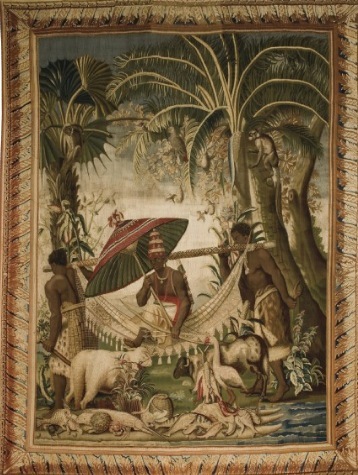 The tapestry, shows three Indians and an African woman with a basket of flowers. 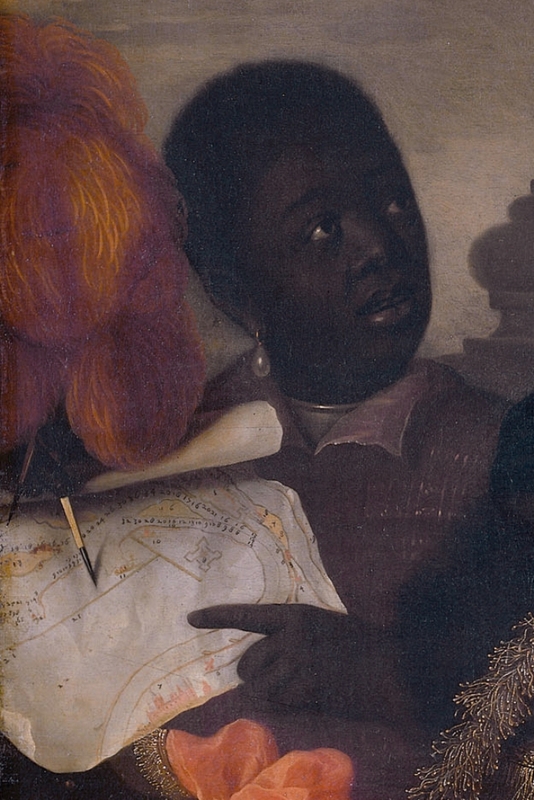 They are not ‘ethnographic portraits’ but people going about what Europeans imagined was their ‘daily business’, in a setting that seems to represent an exotic version of paradise. A number of elements in this composition are based on Albert Eckhout’s painting African woman , such as the large palm tree to the side of the scene. 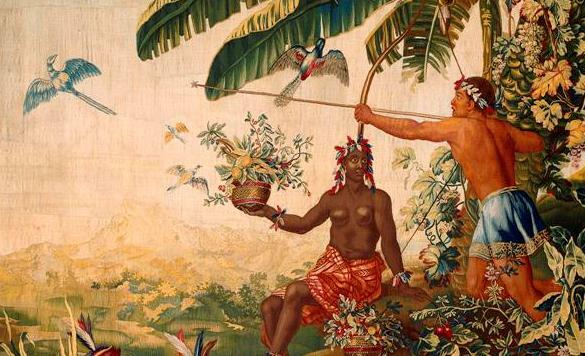 While the painting shows this woman standing and looking at the viewer, on the tapestry she is seated and gazingly admiringly at the figure of a hunting Indian in a classical loincloth. Unlike her counterpart in the painting, she does not wear European jewellery and her headgear is also different; in her basket she has flowers and plants, whereas in the painting this contains fruit. The cartoons for the tapestries were probably drawn by Eckhout himself or the renowned tapestry weaver Maximiliaan van der Gucht 1603 –1689. 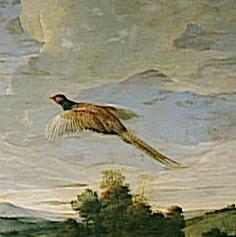 Rebecca Parker Brienen suggests in Visions of Savage Paradise that Governor-General Johan Maurits van Nassau-Siegen 1606 –1679 may have informed the Dutch painters Albert Eckhout and Frans Post as early as the 1640s of his plans to have tapestries made from the artworks produced, by the two painters for him, in Brazil. But how did Louis XIV get them? A money problem, seems to be the key. 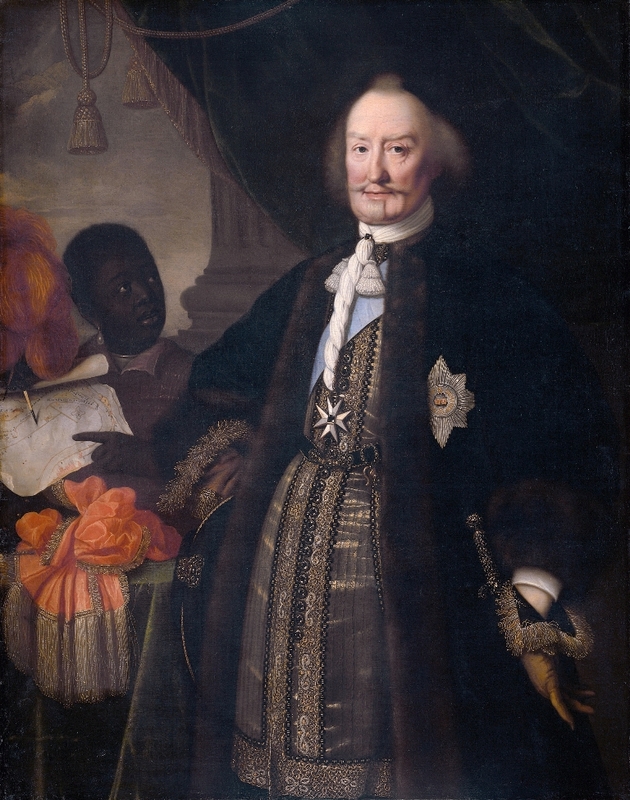 In 1678 Maurits van Nassau-Siegen shipped a number of drawings, some 40 paintings, cartoons, animal skins, stuffed birds and other objects to Paris. 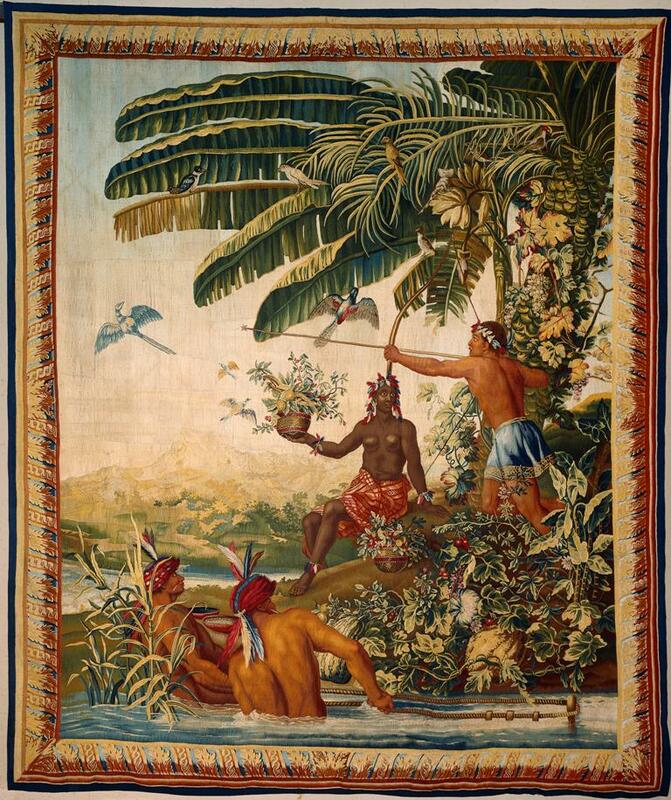 He was in serious financial straits and hoped that Louis XIV 1638 –1715 would commission the celebrated Gobelin factory to make tapestries based on these items, for which he would be paid. ‘…on peut former une tapisserie pour meubler une grande sale ou galerie, ce qui serait une chose tres rare, qui ne se trouve plus au monde […] pouvoir ce beau pays de Bresil lequel n’a pas son parcil dans le ciel […] voyant la grande difference entre l’Europe et l’Afrique..
’he wrote in a letter to Louis’ minister Simon Arnauld de Pomponne 1618 –1699 that same year. The ‘gift’ was accepted, but the tapestries were not made until seven years after Maurits had died. One complete series of Les Tentures des Anciennes Indes tapestries still hangs in the Maltese parliament building. Esther Schreuder See for literature the Catalogue Black is Beautiful, Rubens to Dumas (sold out) 2008. More on this site.